In this interview Rupert Spira answers questions related to realization, individual character, mistaken projections onto spiritual teachers and more. Some of the questions discussed are: Is personal development necessary for realization? and Does awareness need an individual mind to know itself? This interview is featured in the “Science and Nonduality Anthology Vol.4”. Rupert’s first book is “The Transparency of Things”, subtitled “Contemplating the Nature of Experience”. His second book, Presence Volume I The Art of Peace and Happiness and Presence Volume II The Intimacy of All Experience has been currently released by Non-Duality Press. Understanding the assorted Divinities or gods and goddesses of the Vedic or Hindu pantheon is not so difficult as some people may think when it is presented simply and effectively. And that is what you will find in this book. This will open you to many of the possibilities and potentials of the Vedic tradition, and show how it has been able to cater to and fulfill the spiritual needs and development of so many people since time immemorial. Here you will find there is something for everyone. This takes you into the heart of the deep, Vedic spiritual knowledge of how to perceive the Absolute Truth, the Supreme and the various powers and agents of the universal creation. 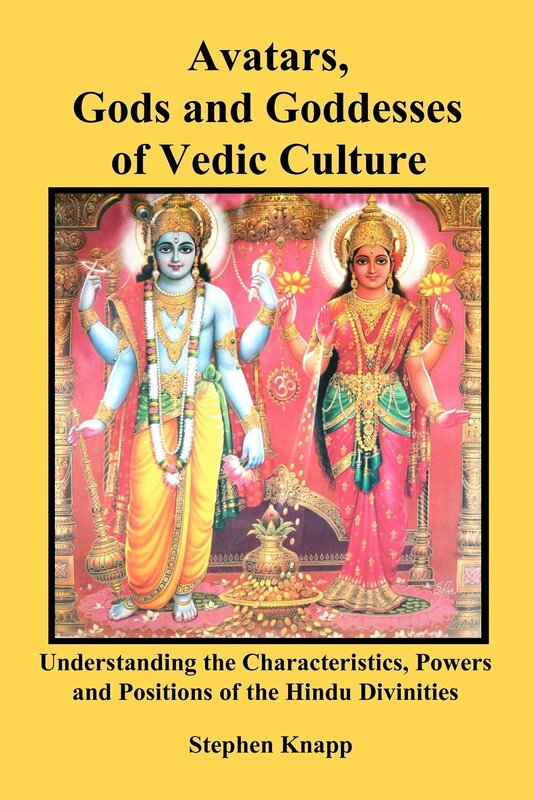 This explains the characteristics and nature of the Vedic Divinities and their purposes, powers, and the ways they influence and affect the natural energies of the universe. It also shows how they can assist us and that blessings from them can help our own spiritual and material development and potentialities, depending on what we need. Some of the Vedic Divinities that will be explained include Lord Krishna, Vishnu, Their main avatars and expansions, along with Brahma, Shiva, Ganesh, Murugan, Surya, Hanuman, as well as the goddesses of Sri Radha, Durga, Sarasvati, Lakshmi, and others. This also presents explanations of their names, attributes, dress, weapons, instruments, the meaning of the Shiva lingam, and some of the legends and stories that are connected with them. This will certainly give you a new insight into the expansive nature of the Vedic tradition. Stephen Knapp grew up in a Christian family, during which time he seriously studied the Bible to understand its teachings. In his late teenage years, however, he sought answers to questions not easily explained in Christian theology. So he began to search through other religions and philosophies from around the world and started to find the answers for which he was looking. He also studied a variety of occult sciences, ancient mythology, mysticism, yoga, and the spiritual teachings of the East. After his first reading of the Bhagavad-gita, he felt he had found the last piece of the puzzle he had been putting together through all of his research. Therefore, he continued to study all of the major Vedic texts of India to gain a better understanding of the Vedic science. It is known amongst all Eastern mystics that anyone, regardless of qualifications, academic or otherwise, who does not engage in the spiritual practices described in the Vedic texts cannot actually enter into understanding the depths of the Vedic spiritual science, nor acquire the realizations that should accompany it. So, rather than pursuing his research in an academic atmosphere at a university, Stephen directly engaged in the spiritual disciplines that have been recommended for hundreds of years. He continued his study of Vedic knowledge and spiritual practice under the guidance of a spiritual master. Through this process, and with the sanction of His Divine Grace A. C. Bhaktivedanta Swami Prabhupada, he became initiated into the genuine and authorized spiritual line of the Brahma-Madhava-Gaudiya sampradaya, which is a disciplic succession that descends back through Sri Caitanya Mahaprabhu and Sri Vyasadeva, the compiler of Vedic literature, and further back to Sri Krishna. Through this initiation he has taken the spiritual name of Sri Nandanandana dasa. Besides being brahminically initiated, Stephen has also been to India numerous times and traveled extensively throughout the country, visiting all but three small states, and most of the major holy places, thus gaining a wide variety of spiritual experiences that only such places can give. Stephen has put the culmination of over forty years of continuous research and travel experience into his books in an effort to share it with those who are also looking for spiritual understanding. An interview with Stephen Knapp on the benefits of India’s ancient Vedic culture and traditions. You can find out more about Stephen’s articles, projects, and books at http://www.stephen-knapp.com, and at http://stephenknapp.wordpress.com. Vedic scholar, Stephen Knapp joins Dr. Rita Louise on Just Energy Radio where he delves into topics including reincarnation, prayer and ritual, engaging in a spiritual practice and extraterrestrials in Hindu culture.